It’s been many years since I used a sports watch to monitor my heart rate while exercising. Until I started using the TOMTOM Multi-Sport Cardio Watch, I had no idea how sophisticated the technology has become. If you want to keep track reliably of your exercise data in great detail, this stylish device will do the trick. TOMTOM has been making navigational devices for many years, so it’s no surprise that the Multi-Sport Cardio has a built-in GPS. That’s only one of the many features to make this a remarkable product. It will keep track of the distance you run, cycle, and swim; show your heart rate at various intervals throughout your activity; tell you how many calories your burned and how long you exercised; and much more. It will give you this info in numbers or plot them on a graph, both on the large display and on your computer’s monitor. Keep in mind the Multi-sport watch is a computer. It may take you the whole weekend or longer to get acquainted with how it works. Lots of help is available online in YouTube videos and text documents, and you’re not likely to master its many features and its menu system overnight. Once you get the hang of it, you’ll find it to be a very good tool for monitoring your exercise and keeping your heart rate within a safe range. Be patient. After unpacking, the first thing to do is go to TOMTOM.com/mysports/getstarted/ and download the free my sports app. Then plug the watch into its docking station and connect the other end to a USB port. When the watch is connected, the software automatically launches and you can set up the device with your personal statistics, height, weight, date of birth, and other personal information. That will also begin to charge the battery. The battery can be fully charged in an hour or less. In the my sports setup page, pay attention to the field with the time setting, Most Americans will set it to the 12 hour clock, and that will sync with your watch when you’re connected to the dock. Regardless of what your system clock says, the watch will sync with the instructions it gets from the my sports setup. Once the watch is set up, the rest is relatively straightforward though not always obvious. There’s a small square below the main screen that serves as a sort of track pad. There are tiny Braille-like buttons on all four sides. Press down and the settings screen appears. After adjusting the settings, press left to return to the main screen. Then press right to bring up the Activities menu. Here you select whether you’re running, cycling, swimming, or other activity. There’s also a setting called Freestyle, which means anything that isn’t running, walking, or cycling. I used it to measure the number of calories burned while digging up creosotebush stumps. Once the activity is selected, press right again and you’ll be told to wait while the GPS engages and gets a fix on where you are. Make sure you’re outdoors. The screen will say Please Wait and withIn a few seconds it switches to Go. 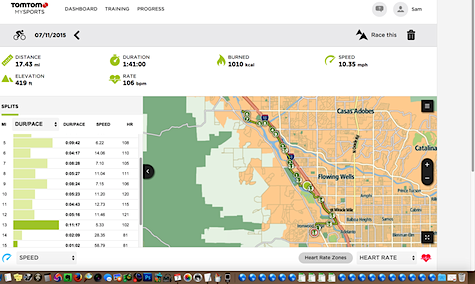 From this point, your heart rate, pace, distance and other factors are being recorded. When you return from your workout, re-connect the watch to its docking station and my sports will launch and transfer the information about your activity to the screen. If you’re into serious record keeping, this will keep you entertained for a long time. Not only will it show you time, distance, average heart rate, and calories burned; it will also show your route divided into segments with your heart rate at different points along the way. Watch the data to see what happens to your heart rate as you’re huffing and puffing up a steep hill and coming down the other side. 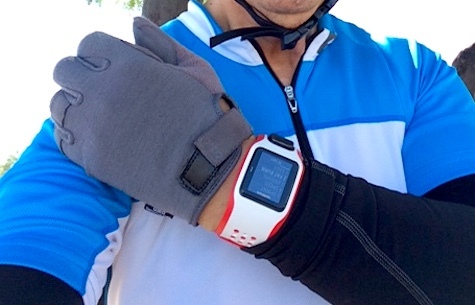 The Multi-Sport Cardio watch also comes with an adapter you can connect to the handlebars on a bike. The YouTube video makes this look like a snap. The diagram in the online user manual is basic and basically useless. The video isn’t much better as it leaves out a crucial step. This is a small matter that begs for improvement. I got mine installed after a great deal of trial and error. See the next paragraph! When you have the handlebar strap in place, remove the watch from its wrist band and snap it into the handlebar strap. Some cyclists find it safer to glance down at the handlebar monitor for info rather than taking their eyes off the road to look at their wrist. The watch has a built-in heart rate monitor that works fine. Whether you use the watch face on your wrist or mount it on the handlebars, keep in mind you won’t be able to view it clearly while wearing polarized sunglasses. If you’re a swimmer, you can use this device in a pool and it will calculate your distance and time plus calories burned, but it will not measure your heart rate. I’m going to make sure our editor, John Nemo, never gets close to my unit, because he’ll borrow it for swimming and forget to return it to me. Sorry, Nemo. Whenever you’re done exercising, you’ll want to end the monitoring on the watch. It isn’t obvious but you press the left button twice, once to pause the activity and twice to end it. Then plug the watch into its dock because that will upload information about your exercise and also recharge the battery. TOMTOM says the battery is good for eight hours. There are many similar devices on the market. I can’t vouch for the others but this one feels solid, looks great, and performs well. I dropped mine twice on a tile floor and it continues to work perfectly. If you get frustrated trying to figure out how everything works, you’re evidently not alone. Go here and you’ll find some illuminating videos. 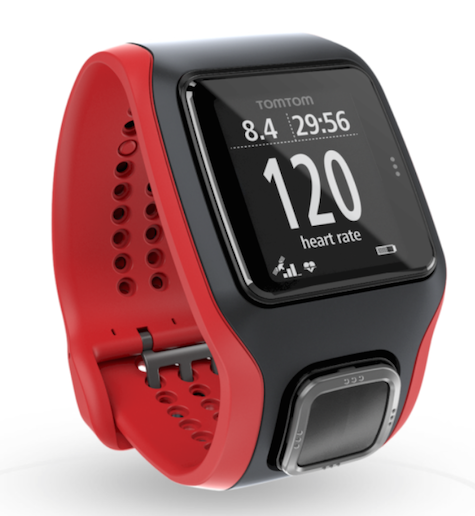 You can also learn a lot about the TOMTOM Multi-Sport Cardio GPS Training Watch by glancing through the reference guide here.